Kyungeun is currently a Senior Lead Data Scientist at NBCUniversal. As a member of a decision science team, she helps executives make informed decisions using data. Before transitioning to industry, her research focused on better understanding our universe through the searches for dark matter and neutrinos. She received her PhD in Physics at Columbia, completed postdoctoral research at Yale. 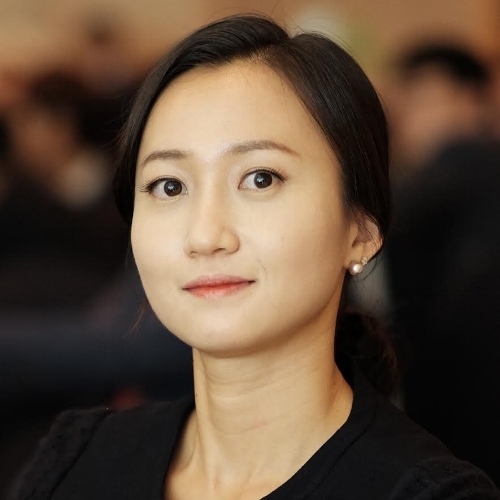 Besides having fun with data science, she likes to go to museums, to collect eye witness travel guides of the places she has been, and to work out especially Zumba. Stereotype roles for a female is the first biggest barrier still prevalent today. As a little girl, my mom would discourage certain behaviors by telling me “you’re a girl and you’re not supposed to act like a boy”. Unlike myself, my younger brother had the freedom to play and do things “boys are supposed to do”. Being the rebellious kid in my household, I wanted to prove that I can be as good as a boy in the boy’s subjects such as math and science. So I worked harder on these subjects and continued to play like boys for a while. While it started as resisting to what I was supposed to do as a girl, I found beauty in both math and science. What attracted me the most was the fact that these subjects do not require sheer memorization, but rather understanding about how basic rules work. Solving complex problems based on the rules I’ve learnt continued to keep me intrigued and led me to pursue a career as a physicist. In junior high school, I considered myself a geek who was not interested in female stereotypical subjects. Despite the fact that I was not drifting away from math and science (actually, I focused even more on these subjects) and I thought I was defying stereotypes for girls, I was trapped in my own stereotypes. Similar to others, I did not think most girls could be good at boys’ subjects. The way I coped with my conflict of being interested in math and science was by suppressing my girly traits. My parents were typical middle class parents in South Korea and education was the highest priority for them. Yet, they were not free from gender stereotypes, and my brother and I were influenced accordingly. Even though I experienced it decades ago, I hear these stereotypes still exist in various societies. One thing I want to mention about gender stereotypes is that it is not favorable to males either. As my brother gets older, I have observed occasions where he needed to work hard to have a more balanced view on circumstances by discarding stereotypes of what males are supposed to do. In addition, I want to emphasize the importance of role models. Having the exposure to female scientists at a younger age would have been early nudge to cloud these female stereotypes. Part of the reason I was trapped in stereotypes of thinking that my female traits were not desirable and I needed to remove them if I wanted to be successful was because I lacked relatable role models when I was in junior high school. I would rarely see superstar type female scientists in the media and, even then, they seemed to be beyond the reach of any reasonable human being and I felt distant from them. Only when I went to graduate school and met great female physicists through research was it possible to have more concrete ideas about relatable female figures’ lives and I could think about a similar career path. It took me an extra step of expanding my horizon outside of physics later to learn further about wider ranges of available role models, what to expect from them, and how to relate them to my own career. While I acknowledge that my experience is limited to one person, I do believe it is not very far from the reality we have in STEM fields currently. I strongly believe deconstructing gender stereotypes, as well as providing relatable female role models to younger women, especially in junior high school, are among the highest priorities. Certainly, STEM communities lose a great deal of valuable contributions from women. I am inspired by challenging problems which push me to the limit a bit further so that I can improve my critical thinking and have fun learning something new, but does not completely exhaust me during the process. Basically, having the right level of challenging problems at different stages of learning, especially during the Ph.D., was key for me to become a real experimental physicist. It is still a very important constituent of my work which keeps me motivated as a data scientist. My mentors and advisors who guided and supported me to pursue my career, as well as many of my colleagues who continued to surprise me with their creative ideas of solving problems inspire me too. One thing I noticed from the latter is that the diversity of a team helps propel a team to succeed. My Ph.D. experiment was an international collaboration consisting of more than 90 physicists at 19 institutes from all over the world. During the commissioning of the experiment, I had the opportunity to work closely with many scientists of differing cultural and ethnic backgrounds every day for more than a year while living in Italy, where our experiment was located. In the beginning, it was challenging to communicate in a language that was foreign to both me and my colleagues. Working with people with different cultural norms also required flexibility in thinking and mutual respect. However, as we worked through these challenges, I was fascinated by the different ways my colleagues approached problems. By working on common problems together, we successfully completed commissioning of the experiment. The commissioning time of our experiment was much shorter than in other experiments, and it was only possible with passion, hard work, dedication, and diverse scientists working together closely. Toward the end of my Ph.D, I conducted an experiment as part of my thesis work, whose code name was XeCube2. Until I was a senior graduate and led XeCube2, I always felt I was in a learning phase and guided by postdoctoral researchers or research scientists in the group. I had mastered critical pieces of experimental physics including building detectors, conducting experiments, running Monte Carlo simulations to aid data analysis, analyzing data, and contributing to papers to be published in peer-review journals. However, I was missing the experience of leading an independent experiment from procedure A to Z and publishing my own paper and that’s what I aimed to do through XeCube2. The proudest moment happened during the data analysis of XeCube2. The one plot I made showed the clear physics behind it and shed light on a better understanding of the experiment. Since that moment, I knew that I was ready to graduate soon and do my own research with confidence.